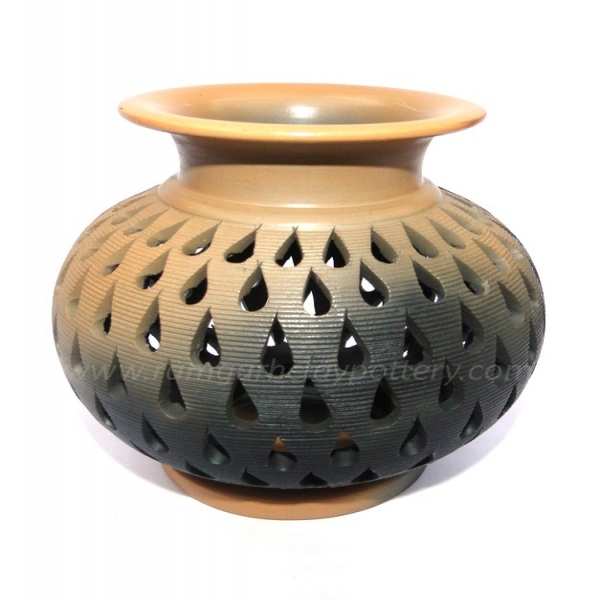 In my hometown Alwar this is known as “KagAzi Pottery” (as it is made with a thin layer of clay).It is very light in weight. Other thing is that it requires a lot of experience, patience, fineness and designing skill at the same time. Due to Modernization this “Art” is fading from our society. The shape and design are basic which depicts the art of Pottery Making in our society. Generally a Lota is used to keep water. I have done little innovation and made this Lota as a T-Light. This has given a new dimension and a new look. I have made cut work design in the shape of a drop of water which connects this Lota with its basics- “Lota for water” This design and concept will be one of the strong point in connection tradition with a modern touch.